In the run up to the Australian Grand Prix, the only rookie driver on this year's grid, Sebastien Buemi has started keeping a diary to record this major event in his life. It makes for fascinating reading. It's going to be a long flight to Melbourne, but I don't mind, I have plenty to read on the plane, including the 325 interviews I have given to Swiss magazines and newspapers since I was confirmed as a Toro Rosso driver. There are some other drivers and team bosses at the airport when I check in, but I don't see them after we go through passport control. I head off to the shops and they follow signs to another gate, although I have never heard of an airline called "VIP." No, I was wrong, they are on the same flight, but once again I don't see them on the plane. They all disappear through a curtain. I feel sorry for them, as I am lucky enough to sit near the back of the plane with the rest of my team. I get a middle seat, which is neat, as I can talk to two people either side of me. And it's handy for the toilets too. Halfway through the flight, I am feeling rather hungry and have an upset tummy from eating too much fruit, but there is nothing else on the menu that my trainer told me I'm allowed to eat. Maybe next time I should use a Japanese airline as they are more likely to serve Tofu and raw bean shoots. The other F1 people seem to like drinking wine. I think they are sad to be leaving their families after spending a lovely winter with them and are drinking to forget their sadness at having to be away for about a month for the first four races. Before I left the factory, my press officer - hey, do you like that? "my press officer" stuff - told me that when I land in Melbourne there might be some local TV film crews and newspaper reporters and photographers and would I mind doing interviews with any of them who asked. I am surprised at this lack of organisation. It is not the way we would do things in Switzerland, so before leaving I find the emails for these TV stations and give them my flight details. They reply and sound excited, saying they might want to talk to me for a minute or two. I mail back, saying they could have a full 20 minutes each, as this would give them a better understanding of my views on F1. Finally, we land in Melbourne. I feel very proud when the passport control man says "Welcome to Australia Mr. Buemi," as I didn't expect to be famous here already, but then I realise he is reading my name from the passport. Never mind. It's a scandal! I have been taken to a small room and there is talk of giving me something called a "full body search." It's ridiculous but apparently I have committed a crime by bringing 20 bars of Toblerone chocolate into Australia. I try to explain it is Swiss chocolate and therefore not just a "foodstuff." Eventually they let me go, but they keep the chocolate. I am worried there will be no TV crews still there and I will be in trouble with my press officer. But I'm lucky and do many interviews which I am sure will be a great publicity coup for the team as I don't see other drivers doing as many interviews as me. Unfortunately, the team forgot to wait for me and it is dark when I leave the airport. So I take a taxi to the city and the driver says that as it's my first time here, he will only charge me 350 Aussie Dollars. He tells me the exchange rate is 15.75 dollars to the Euro, so taxis are obviously much cheaper than back home. When I get to the hotel, my team-mate Sebastien Bourdais is there. He tells me that as I've got here so late, I shouldn't worry about getting up early for the first technical meeting at the track tomorrow and he will tell me everything the engineers say. I think he is really nice to do this and we will get on really well. He is giving me lots of little tips and also mentioned that the FIA's Charlie Whiting doesn't mind at all if you are late for the Drivers' Briefings. Also, we have both been invited to the Governor's Cocktail Reception, but Monsieur Bourdais (as he says I can call him) promised he would let me go alone, so I could do all the interviews and get all the publicity, as it is my first Grand Prix. He really is a gentleman. That must be why he chooses to live in Switzerland. I think I'm going to enjoy being a Formula 1 driver. To hear what Sebastien Buemi really has to say and for media opportunities with him and Sebastien Bourdais in the run up to the Australian Grand Prix, TV crews are invited to catch them when they land at Melbourne Airport: Buemi at around 20h30 on Monday 23 March, Bourdais at around 08h40 on Tuesday 24 March. On Wednesday afternoon at around 14h00 in Melbourne Park, both Sebastiens will be playing mixed doubles, teamed up with international women's tennis players, from Tennis Australia. "My first F1 practice session and I had a lot of new things to learn and to deal with. It was not too bad, we tried various changes and improved the car lap by lap. The second session got off to quite a good start, but later we had some difficulty with finding the right set up. Given our lack of testing with this car, today was like a test session which we used to learn more about the car. It's my first time at this circuit and I still need to get used to it and I learned a lot, but there is still plenty to do to improve tomorrow." "First race first point, so I'm very happy. Maybe we had a bit of luck with the accidents, but even without that we were not too bad and our strategy worked well and I am very happy with the way my race went. I made a mistake when I was alongside Massa, hitting the limiter button, but when he put the KERS on you could really see the advantage it brings. I am pleased with what happened today because to get a point in the bag at the first race takes some pressure off. The team did a fantastic job considering that we have not had much testing time with the car before coming here. It's a dream really and not the result I expected on Friday. It shows we have a good potential." "I had a very tough first part, as after just three laps, the Option tyres were graining. Several cars passed me so the team called me in and the second stint was not too bad. When the Safety Car came out, it was clear we had to fuel to finish. A few more Safety Cars would therefore have helped as I did a final stint of 36 laps and in the early part the car felt a bit like a caravan with all that fuel weight on board. I had a very big moment where I was lucky not to crash and then I had a seat belt come loose and I had to find a way of locking myself into position in the car. I think we should be a bit stronger in Malaysia next weekend." Franz Tost: "Buemi, first race one point: it's the start of a good career, as scoring a point on one's debut shows the driver is talented and it's thanks to Red Bull that he is in our driver pool. He qualified well and with a bit of luck he might have made it to Q2, so we'll be aiming for that in Malaysia. He was up to tenth after one lap and raced without making mistakes, defending his position, having an interesting fight with Rosberg. He is on the right path and I think we have a really good driver in our line up." Because Jarno Trulli received a penalty after the race, our Sebastiens, Buemi and Bourdais each move up one place to seventh and eighth respectively, which means our points tally from this race is now 3 points. Although it wasn't planned to introduce KERS until later in the season, recent progress made at our Faenza R & D facility means that Scuderia Toro Rosso will now use Kinetic Energy Recovery Systems on its cars in Sepang, for the second round of the World Championship. "We are indebted to Professor Hugh Masterby-Jerrkin of Imperial College, London for his department's assistance in moving this project forward so quickly," commented Wayne Kerr, Toro Rosso's Head of KERS. "While the team was racing in Melbourne, we came directly to Kuala Lumpur to evaluate the system in real conditions and for this we were given invaluable help by the Thermal Energy faculty of the Kuala Lumpur Polytechnic, particularly the head of department, Doctor Ku Lin `Ng Phaan. Energy recovered under braking is used to drive a refrigeration unit to chill down the cool store. This is connected into a special driver suit, so when the driver presses the KERS button (for a maximum of 6 seconds per lap) cold liquid is circulated around his suit reducing his body temperature. Studies have shown that an increase in core body temperature of just 1 degree can reduce driver performance by as much as 23%, and so while this system does not give any actual power gains, it should still be a significant performance advantage. "I drove here last year in GP2, so I know the track. It's different of course in an F1 car but no problem. The heat is not bothering me and you just have to make sure you drink a bit more to cope with the sweating. Today, the track remained pretty consistent which meant we were able to try several things on the car. I am quite happy with what we have seen. In terms of tyres, it doesn't look as though the difference between the two types is a great as in Melbourne and the degradation appears to be less. Our speed seems reasonable, but we still have a lot to do. Q2 tomorrow? Who knows, it might be wet, so let's wait and see." "As was the case here last year, the track improved a lot between the start and finish of the first session and then again in the second. It was a dramatic change and the few drops of rain that fell did not help us in understanding the situation. In the afternoon, we tried something on the car which took us down the wrong route. It's still a case of finding out what works and what doesn't on the car. I felt there was a big difference in terms of grip from the prime and option tyre so I did not get the most out of them. A long run on the options was quite satisfying and I was fairly happy with the balance compared to what I had on the shorter runs, so that is encouraging." "We were quicker than expected in Qualifying which is great, even if we are still not where we want to be. I would expect that as we develop the car more, maybe by the time we get to Spain we can be thereabouts. I'm not sure if I want rain or not tomorrow, but for sure, it might be the best chance we have of scoring points. "On my penultimate set of tyres I was in a Q2 position and then on my final set I improved a lot in sectors 1 and 2. Unfortunately, in the final sector, I caught the kerb and ended up in the gravel. It's a shame. For tomorrow, the best thing for me would be to have very changeable conditions to see if we could profit from any unusual situation that might develop." Giorgio Ascanelli: "Once again I am happy with the reliability of our cars: in the five days of running we have had so far in this year's championship, we have had just one problem with a minor component yesterday afternoon. Getting one car into Q2 is an achievement. Of course, we could have done better, but our level of understanding of the car is improving and the drivers are getting used to it. Today, Buemi made a mistake, but if a young driver doesn't make mistakes he doesn't learn and Bourdais did a good job." "Round about lap 18, we were running low on fuel so we were hoping for rain before the end of the first stint. It didn't come quite in time and we gambled on extreme wets as heavy rain was expected, but instead it was more like drizzle, so we changed again to intermediates. Then the rain really came and I had to come in again for extremes and after that, the race was stopped. It was a shame, as it seemed we were pretty competitive in these very changeable conditions. I would have liked to restart, as it might have been an opportunity to pick up points, even if only half-points." "We were really going well and I think I was around P7 or 8 and the plan was to come in on the following lap, but then I went off at Turn 5. The extreme tyres were completely gone, like driving on slicks and I slowed down, but obviously not enough for the amount of water, so I spun, went into the gravel and stalled. We were competitive in terms of speed at some stages, running in the top six lap times, even though I was running last, having had to come in to change the nose. I think one of the Force India cars pushed me wide at the exit of the last corner and I ran over something that broke the front wing. I am disappointed as the spin at the end was my mistake and it is on days like this that we should have picked up some points." "Our weekend seems to have started off quite well. We have made progress in terms of understanding the car and using it to its best. There is still some work to do, specifically in terms of making better use of the Option tyre. Actually I was quite surprised to see how well they are holding up and they definitely have more than one lap in them. I'm not saying we'll run them for 30 laps, but it's much better than expected. We can definitely see that the small updates we have on the car since Malaysia are working well." "It's my first time here and beforehand I spent a lot of time on the Red Bull Technology Simulator and it was definitely a big help and I plan to use it more in the future. It is difficult to quantify, but for sure it helps. I had a technical problem in the morning which cost me some time, but everything was back to normal this afternoon and we were able to make a step forward. We look more competitive than in Malaysia and we are definitely improving. I didn't get a perfect lap today, so I think I can do a lot better tomorrow. I like the track; it's very big, very new, very everything!" "I am really happy to be in Q3, as it's more than I had expected. I don't think I could have got any higher up the order. On low fuel, the car was very good, but we didn't have any new Options left for Q3, so I had to do three flying laps on the Prime, so considering that, we can be satisfied with this. The team worked really well, doing a fantastic job to improve the car a lot since the start of the season and today it worked very well. Now, I am very much looking forward to tomorrow's race". "I made a mistake, it's as simple as that. I tried to optimise my line to take Turn 8, but I cut the apex too much and got on the marbles and the dirt on the left side and so the car never really turned in. Because of the dirt on the tyres, the next few corners were a disaster, losing me around half a second. Yesterday had been very promising but for whatever reason, today it didn't work out. When you see my team-mate did two great laps, you can understand that the potential is there. Tomorrow, I will see what I can do, and even if it's hard to make up places here, I'll keep pushing." Giorgio Ascanelli: "It's fair to say we are learning a lot about the car and we must congratulate Buemi for getting into Q3 at only his third attempt. He is still on a very steep learning curve and he didn't get it quite right in Q2. We had to use all our Option tyres in the first two sessions, to make sure of getting into Q3. 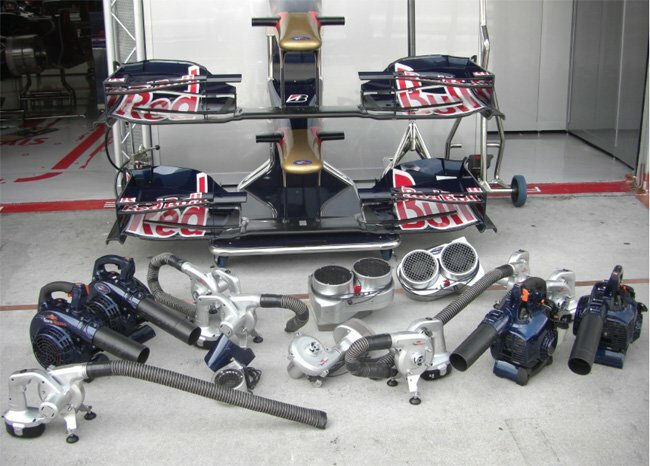 I also want to thank Red Bull Technology, because the car is clearly well born. I think Red Bull Racing deserve their pole and I'm cheering for them." "I am very happy as the team did a super job so that we got another point to take away from here. I am pleased that in three races, I have scored twice. Maybe I could have done a little bit better, but I'm happy all the same. We were very competitive in the early stages and I got past Raikkonen and Hamilton, but after that I struggled a bit. I think it was one of my hardest races ever. As for the incident with Vettel, it happened under Safety Car conditions: I didn't see him and I tried to swerve to the right, but it was not enough to avoid him. We changed the wing on my car and I'm glad I didn't spoil his race." "I started fifteenth and finished eleventh, even with a couple of spins. I've got mixed feelings, because I don't think we should have raced as there was so much aquaplaning. The fact the cars have a lot less downforce this year, aggravates the situation as it's hard to get the car down onto the track surface. I could have spun 15 or 20 times and Sutil's crash showed what could have happened. The one positive thing is that it was probably a good show for the fans." Franz Tost: "First, well done to Red Bull Racing. Congratulations on doing a fantastic job with a one-two finish thanks to Sebastian and Mark. On our side, we picked up another point thanks to Buemi, who drove a good race, given the difficult conditions today, in what is only his third F1 race. Overall, it means we can head to Bahrain in an optimistic frame of mind." "I think these high temperatures will make life difficult for everyone, but we are making sure we are as well prepared as possible to deal with the heat. At the moment, I feel good in the car although we still need to work to improve, even though it is difficult to say what our lap times mean, as we don't know what fuel loads the others were running. I am happy with the car, even if it can always be better, as I lacked traction coming out of the slow corners and occasionally, I locked the front wheels under braking." "The track has changed a lot from the morning to the afternoon session and that has made it difficult to assess the two types of tyre. It seems that the difference in behaviour between the Prime and the Option is very much related to the track temperature increase. Therefore, this afternoon it was difficult to assess the effect of changes we made to the car as the conditions changed. But as always on a Friday, it is nearly impossible to evaluate where you are compared to the others, until qualifying. 13th and 14th is not where we want to be tomorrow, but we will work hard now and then see what happens."